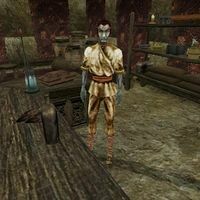 Tervur Braven is a Dunmer trader located in his store on the southern side of the St. Delyn canton plaza in Vivec. Apart from a good selection of Marksman supplies, Tervur offers mostly clutter. This page was last modified on 13 April 2013, at 01:39.